Last week I shared a time-saving tip about how to use pre-made templates for some of your regular lessons and activities in the classroom - (view the post here). I received quite a few requests about sharing these templates, but I couldn't share the ones I showed because they were made on school time with school technology. So ... I've found a little time to recreate the templates so I could share with you. 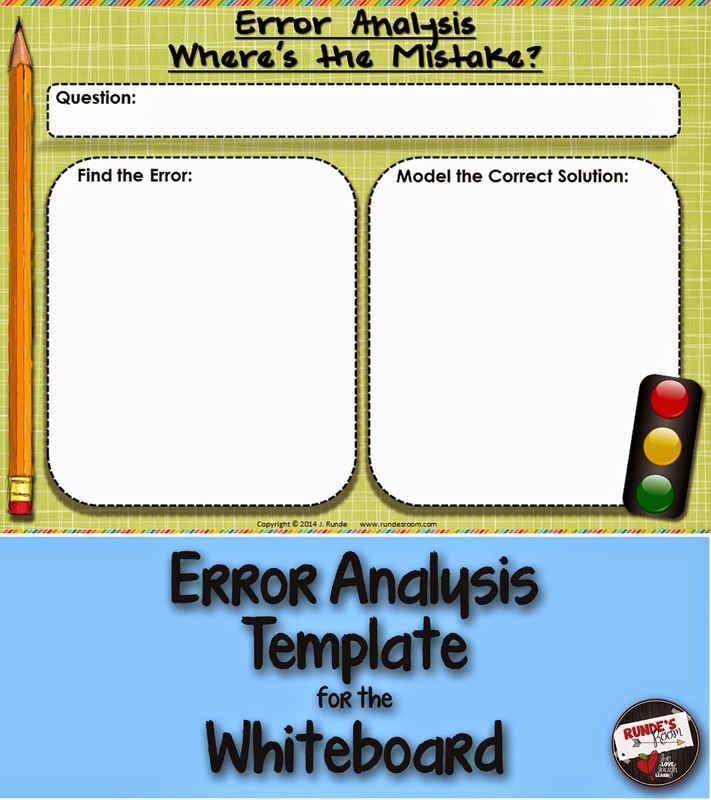 Today I'm sharing my Error Analysis Template. This is a blank template I use often in my classroom. This resource includes both the powerpoint version (so you can add textboxes over top of where you wish to add your information), or the PDF – which is what I use. I simply project the PDF onto the whiteboard and we use our whiteboard markers to write in the boxes. You can also print and use the blank PDF and use a center or a guided math activity. Click on the link above or the picture below to grab a copy for yourself. I use this activity as reinforcement/review when I see an error commonly happening in the classroom. I can quickly pull up the template (which I have as a shortcut on my computer desktop) and write in the question and incorrect solution. I ask students to look at the incorrect solution, find and circle the error on the board, and then model the correct solution on the right hand side. You can have all students do this on individual whiteboards, or in their notebooks, or have one student volunteer to come to the whiteboard and model for all. You could also have your students turn and talk to a partner to collaboratively determine where the error is and how to solve the problem correctly, before someone solves it on the board. I also use this template when completing “My Favorite No” activities. I've posted the video before, but it's definitely worth posting again. I also included a copy of the template with and without the traffic light comprehension. We use the traffic light to discuss our level of comprehension of a certain concept – green means “got it”, yellow means “still practicing”, and red means “I need some help.” For a quick template activity, I would just ask students orally to raise their hands to show their comprehension level as I pointed to each color. My students were always comfortable sharing this information in class (encouraging growth mindset), but if you feel your students would be uncomfortable with this, you can use the template without the traffic light.